SUDBURY, Ont. – Vale Canada and Glencore have approved two new projects for their Sudbury Basin operations that will total more than $1.6 billion – deep development of the Copper Cliff and Onaping mines. 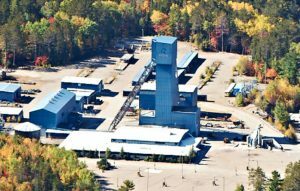 Vale has decided to go ahead with the $760-million phase one development of the Copper Cliff Deep project. The Copper Cliff South shaft, closed in 2008, is to be refurbished; the headframe, loading pocket, dumping stations will be reconfigured; and two new hoists will be installed. The coarse ore handling station and crusher on the 4000 level as well as the ore and waste handling systems are to be rehabilitated. Glencore will proceed with the $888-million Onaping Depth project that it started last year and for which it only recently received approval. A winze from the 1200 level of the Craig mine will be driven to reach 14 million tonnes of ore at Onaping about 2,500 metres below the surface. The winze is to be raise bored to the 1900 level and then slashed to 2,650 metre. Full production from Onaping Depth is expected in 2025. Visit www.Vale.com and www.Glencore.com for more information about each company’s operations in Ontario.